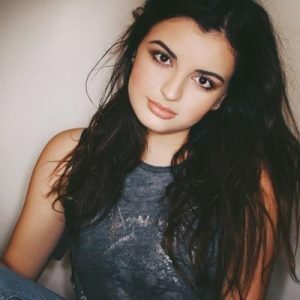 Rebecca Black is an American pop singer and social media personality. She is best known for her song “Friday” which became an Internet sensation in March 2011. The song was co-written and produced by Clarence Jey and Patrice Wilson of Ark Music Factory. Her other well-known singles include “Sing It,” “Person of Interest,” “Saturday,” and “In Your Words.” She has more than 1.4 million subscribers on her YouTube channel and over 1.23m followers on Twitter. Born Rebecca Renee Black on June 21, 1997, in Irvine, California. She is the daughter of Georgina Marquez Kelly and John Jeffery Black, who are veterinarians. She is of Mexican descent on her mother’s side, and of English, Italian, and Polish descent on her father’s side. She has one younger brother named Chase. She started singing and dancing at a young age, and was encouraged by her mother to pursue a career in singing. She attended private school from kindergarten to 6th grade, and moved to a public school due to bullying. *She was born in Irvine, California on June 21, 1997. *Her parents divorced in 2003. *She won the “Choice Web Star” Teen Choice Awards in 2011. *She was appeared in the music video for Katy Perry’s single, “Last Friday Night (T.G.I.F. )”.